I approach the subject of Iranian-Americans not from a purely professional perspective but, perhaps more importantly, from my personal experience as an American woman of Iranian descent who is continually engaged in the exciting although at times painful process of identity construction. Surely, my training as a social scientist assists me in the inter-related tasks of defining my identity and asserting my influence vis-a-vis Americans as well as Iranians in and outside of Iran. In fact, my very personal understanding of these issues is informed by my reading of scholarship; specifically, I owe intellectual debts to such colleagues as Mehdi Bozorgmehr, Mohammad Chaichian, Ali Akbar Mahdi, and Hamid Naficy, among others. However, I will address these issues less as a social scientist and more as an individual who reflects on the issues at hand. Consequently, my remarks shall be more preliminary than conclusive, more impressionistic than scientific, and briefer and more informal in order to solicit maximum response from you, the audience. I assume that you are here to think about how you yourselves define your identities and influence vis-a-vis Americans as well as Iranians both in and outside Iran. Specifically, I intend to address four questions: Do Iranians live in the U.S. as "immigrants" or "exiles"? How do the children of Iranians relate to their parents' homeland, Iran, and/or the host society, the U.S.? What influence may those calling themselves "Iranian-American" have among Iranians, whether in or outside Iran, and/or vis-a-vis other Americans? Are there spaces for multiple conceptualizations of Iranian-ness and American-ness? Do Iranians live in the U.S. as "immigrants" or "exiles"? We lack reliable data on how many Iranians or individuals of at least partial Iranian descent live in the U.S. During the 1980 and 1990 census, an untold number of Iranians and individuals of Iranian descent did not admit to their origins, perhaps fearing that the data would not be kept confidential. Iranians in the U.S. speak in terms of 1-2 million people, whereas sociologist Mehdi Bozorgmehr has estimated a more modest 250,000 or so. The figure ostensibly lies somewhere in between 250,000 and 1 millon. More important than the number of Iranians living in the U.S. is when they came and how they perceive themselves -- as "immigrants" or "exiles." Prior to the "Islamic" revolution of 1978-79, Iranians did not have a lengthy history of emigration beyond the Asian continent. During the 1960s and early 1970s, Iranians by the tens and hundreds trickled in to the U.S. to pursue educational and professional advancement. They settled in cities and towns located close to colleges, universities, and major business and industry. For example, my own parents came to the U.S. in 1963, in order that my father pursue his medical sub-speciality of child and adolescent psychiatry. My parents gave little thought to staying in Detroit, Michigan where a world-famous psychiatric clinic was then located. Other Iranians in the metropolitan Detroit area also tend to be the families of physicians or of engineers who work for the automobile industry. In my observation, many of these families remained in the U.S. almost unintentionally at first -- giving birth to children, enjoying educational and professional successes, living comfortably, and returning to Iran for regular visits. Yet eventually, these families watched their children make American friends, attend American schools, and speak English as their first and sometimes only language. Some of the Iranians who settled in the U.S. before the revolution even became naturalized American citizens. The events of 1978-79 suddenly and unexpectedly accelerated Iranian emigration. The political repression, socio-economic dislocation, and inter- state war resulting from the "Islamic" revolution triggered an out-flux of Iranians to Europe and North America during 1978-79 and the early to mid-1980s. The majority of Iranians who have come to the U.S. since the revolution reside in three metropolitan areas -- Los Angeles, Washington, D.C., and New York. In conversations with many of these Iranians, both young and old, a consistent theme emerges: These people feel that they were compelled to leave their homeland. Although they have pursued personal safety and/or professional advancement in the U.S., they did not choose to be here. And even to this day -- twenty years after the revolution, some await their return to an Iran under another political and socio-economic system, whatever that may be. I draw the distinction between the experience of Iranians who arrived in the U.S. before and after the revolution to answer the question: Do Iranians reside in the U.S. as "immigrants" or "exiles"? Arguably, Iranians who came to the U.S. prior to the revolution -- some of whom have become naturalized U.S. citizens -- are "immigrants." They left their first homeland -- Iran, the place of their births and childhoods -- and have chosen, however reluctantly, to stay in the U.S., adopting this as their second or new homeland. Although these immigrants feel nostalgia for Iran, they harbor few if any desires to return to their first homeland. Rather, they tend to adopt a bi-cultural perspective to life, espousing what they regard as the best in both American and Iranian values. Although sometimes they are admittedly stuck with the worst of both worlds. Iranians who arrived in the U.S. after the revolution still live here more as "exiles." They reject integration into the host American society, but do not wish to return to their homeland. Yet they regard Iran as their first and only homeland, keeping alive the desire for return. Although exile communities inadvertently adapt and adop cultural patterns from the host society, the U.S. in this case, they resist this process sometimes vigorously -- clinging to idealized visions of their homeland's culture, language, and politics. To explain this metaphorically, exiles, whether Iranians or others living in the U.S., never quite unpack their suitcases; at least one bag remains packed and always ready for travel in case the opportunity to return to the homeland presents itself. Whether immigrants or exiles, many Iranians have been in the U.S. long enough to find themselves in the position of raising their children who were born here. This reality inspires my second and third questions which are inter- related: How do the children of Iranians relate to their parents' homeland, Iran, and/or the host society, the U.S.? And what influence may those calling themselves "Iranian-American" have among Iranians, whether in or outside Iran, and/or vis-a-vis Americans? To analyze the identity construction and influence projection of Iranian- Americans, we must define who these people are. Iranian-Americans consist of three groups: (1) Iranian immigrants who have become naturalized U.S. citizens; (2) individuals who are of mixed parentage -- both Iranian and American; and (3) the descendants of Iranians residing in the U.S. I am among this last group of people and, thus, shall focus on them. Yet. I do not typify the first generation of Americans of Iranian descent -- what social scientists have referred to rather confusingly as "the first and a half generation" or the "second generation." Why am I atypical of this last group? Mostly due to my age. In fact, Americans of Iranian descent my own age -- thirty somethings -- are rare, precisely because few Iranians came to the U.S. prior the revolution. The typical child of Iranian parents in the U.S. is not a thirty-something but, at the very oldest, a twenty-something. Most such children are growing up now, approaching adolescence. Unlike these young children and adolescents, Iranian-Americans of my own generation felt the reverberation of the "Islamic" revolution as teenagers living here in the U.S. -- witnessing the varied responses of our parents to this event and experiencing the anti-Iranian prejudices evoked by the American hostage crisis. Indeed, the politics of the revolution and of U.S.-Iran relations stimulated my own reflections about how to define my identity and project my influence vis-a-vis Iranians and Americans. During my teenage years and even more so as a young adult, I have sought to resolve the question of how to relate to Iran and Iranians, on the one hand, and/or to the U.S. and Americans, on the other. I asked myself questions such as: What about my lifestyle and personality is Iranian or, for that matter, American? In which language do I feel most comfortable expressing myself -- English or Persian? (I suppose the answer to this last question is obvious!) Can I understand the experience of Iranians who have come to the U.S. after the revolution? Can I relate entirely to Americans of European and/or other heritage? These are not easy questions to answer and still persist in my mind. These questions point to the most difficult but exciting one: Who am I? At least for the time being, I have answered this largest existential question by identifying myself as a women of Iranian nationality and American citizenship. What is the difference between "nationality" and "citizenship"? Nationality is defined by cultural, linguistic, and, ultimately, racial traits -- one's blood lineage. I have Iranian parents; hence, I am an Iranian by nationality. However, I would caution against over-emphasizing nationality per se and its racial quality in particular. Iranians of various ideological stripes -- but particularly those who harken back to the glories of empire and monarchy -- have constructed the myth of a "pure" Iranian nationality, directly traced to the ancient Aryan race. While historical links may exist, this myth grossly over-simplifies Iran's history of conquest, invasion, and migration over two millennia. An emphasis on "race" or lineage runs the risk of essentializing Iranian identity. Yet identity, like culture, is not a fixed essence, but rather a process of becoming. Citizenship, at least in theory, is not an issue of race or lineage. By contrast, citizenship consists of one's rights, roles, and responsibilities to the society in which s/he lives. I was born and raised in the U.S., continue to live here, and, thus, may be more effective as an actor in this society. As an American of Iranian descent, I not only enjoy certain rights -- whether I define these as basic human rights or rights expressed in the U.S. constitution. I also feel a profound sense of responsibility toward this society. And despite the prejudice that I have occasionally encountered as an American of non-European heritage, I feel that I can be an effective actor and even an agent of change in this society. For instance, my very background has inspired me to dispel mutually-destructive stereotypes among Iranians and Americans. Yet because I live here among Americans of primarily European heritage, I have more opportunity to correct misperceptions about non-European people and especially about Arabs, Iranians, and other Muslims. I feel charged with the responsibility of eradicating prejudice and discrimination, particularly among Americans of European descent, in both my personal and professional endeavors. More significantly, I can be effective in undertaking this responsibility precisely because I am an American citizen who has an excellent command of the English language and of the credo on which this society claims to be based -- freedom and fairness for all under the rule of law. I should digress to confess that when I first composed the outline for these remarks, I conceptualized the projection of influence by Iranian-Americans in macro-political terms. I sought to explain how those of us who are Iranian- Americans shape the political realities of Iranians, whether in or outside Iran, and of Americans. I gradually had to re-consider such grand thoughts because I was struck by the realization that projecting one's influence is a more immediate and intimate matter -- how does one alter, even improve, the political reality of those closest to you; those whom you feel you can reach. Dispelling prejudice is a starting point in this regard but does not exclude the possibility that Iranian-Americans may seek wider influence on events, whether in Iran or the U.S. Yet those of U.S. who are Iranian-Americans should resist the temptation to define our influence only in relation to macro-political developments such as the future of U.S.-Iran relations or the emergence of civil society inside Iran, lest we quickly feel ineffective. Nor should we fall into the trap of under-estimating our impact; we are not marginal by any stretch of the imagination. Rather, we must measure and balance where -- vis-a-vis which communities -- we may be most efficacious. I have offered merely vignettes from my own experience with identity construction and influence projection. I do not presume to nor can I predict how the children of Iranian parents who are growing up here now will relate to Iran and Iranians and/or to the U.S. and Americans. Moreover, I am unaware of research that addresses this question. On the one hand, these children may not feel the compulsion to search for their identities in the way thirty- somethings like us experienced, because political events in their parents' homeland may seem distant even irrelevant. On the other hand, those children of Iranian parents who live in major metropolitan areas may benefit from attending organized Persian language classes and socializing with others like themselves in sizable ethnic communities -- opportunities I lacked growing up in suburban Detroit. This new crop of Iranian-Americans may find their identities less as a result of crisis and compulsion and more as a consequence of these wonderful opportunities presented to them. Well, at least I hope so. I must conclude by answering my fourth question enthusiastically and affirmatively: Are there spaces for multiple conceptualizations of Iranian-ness and American-ness? Yes, absolutely. Most Iranians that I know did not expect to be residing in the U.S. for more than a few years; they still express an understandable reluctance to embrace fully the host society. Yet the children of Iranians born here have little if any tangible experience of Iran as a society. To expect them to embrace Iran and Iranian culture as their parents do is not only unrealistic but unfair. Conversely, to allow them to abandon completely their heritage would be a huge loss. I do not presume to tell Iranian parents how to raise these children, for I have no experience in this task. Nor am I willing to tell Iranian-Americans how and where they should assert their influence. I can only offer my experience as the child of Iranian immigrants who eventually embraced the notion that I could have influence on others -- particularly on Americans but also on Iranians, mostly but not exclusively in the U.S. However, I am hopeful that the teenage and twenty-something children of Iranian parents in the U.S. might maximize the opportunities given to them to serve in the unique although sometimes awkward position of bridging two cultures. 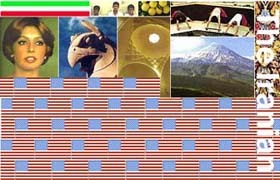 Rather than merely assimilating into the so-called "melting pot" of a diluted yet hegemonic white, European culture in American society, these children (along with others of recent immigrants) can design a new model of relating to both their parents' homeland, Iran, and their own homeland, the U.S. These young people will enjoy the rights of other U.S. citizens and may also be effective agents of change -- contributing to American society as producers and consumers of a syncretic culture and politics informed by their self-perceptions and understandings of the world around them. I shall end by acknowledging that I have probably raised more questions than the first four I outlined. And I have offered somewhat tentative answers to these first four. I hope, that I have stimulated your thinking about the inter-related issues of identity construction and influence projection. I feel that my very presence here is evidence -- albeit unscientific -- that there are spaces for multiple conceptualizations of Iranian-ness and American- ness. We must carve out those spaces and empower our children to do as well. * Identity crisis: Who am I?